Penn defensive tackle James Morris lined up at the five-yard line across from the South Bend St. Joseph offensive line, and locked his eyes on the Indians’ quarterback. As soon as the Indians snapped the ball, Morris blasted through the Indians’ front line. Morris hammered into the St. Joe quarterback as he dropped back into the end zone. 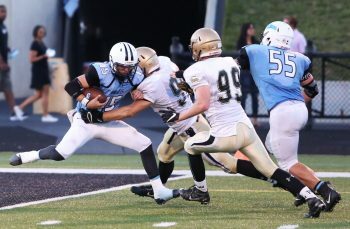 Then, the 6-foot-1, 230-pound avalanche wearing Gold and Black pounded down on the St. Joe quarterback for a safety, putting the Kingsmen on their way to a key Northern Indiana Conference victory. Now, Penn’s Kingsmen are rolling in the Class 6-A state football playoffs, and one of the biggest forces for the Kingsmen is Morris. Morris is a three-year starter, which is very rare for Penn Football. He helped lead Penn to the State Championship Game as a sophomore. In his three seasons, Penn is 33-3 and the Wild Bunch Defense has been ranked in the Top 5 in the state. From the early days of Flag Football, starting in first grade, James fell in love with the sport. Encouraged by his father and grandfather, Morris pursued his passion for Football. He played Rocket Football and played middle school Football. Now, Morris is a defensive horror for opposing teams. Morris, though, puts his relationship with the team above his personal accomplishments. Earlier this year, Morris was offered a scholarship from Dayton University, and has seen interest from other college football teams. Still highly considering Dayton, James is trying to decide if he wants to continue his football career into college. Morris said that he has benefited from his football experience. Morris has been a difference-maker at Penn in many ways. In addition to being a First-Team All-State candidate, he is a two-year member of the Penn Student-Athlete Leadership Council, he is a Peer Leader, he is a leader in service to the exceptional education community, and as one of Penn’s top students, he is going to graduate with an Honors Diploma. Morris is also a gifted graphic designer, and has created starting line-up gifs and the Penn Football Team poster that has earned praise as professional quality.